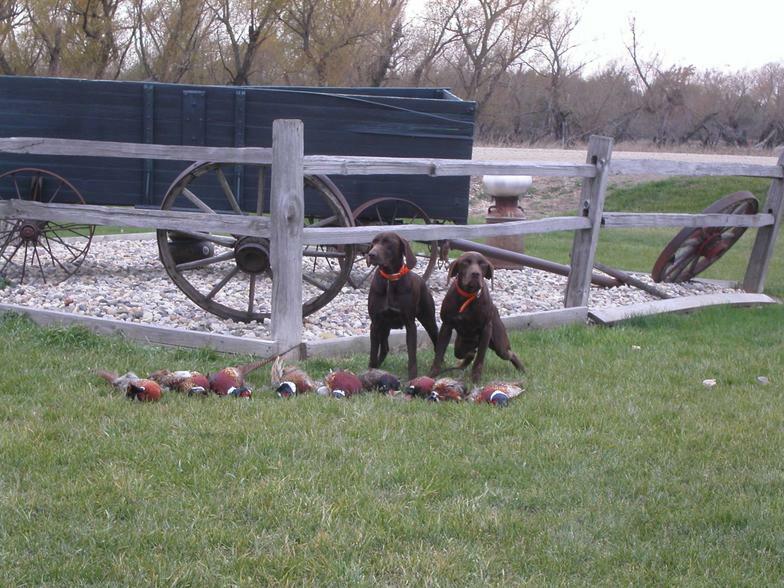 Here's a collection of Grand River Gun Dogs at work and Play. 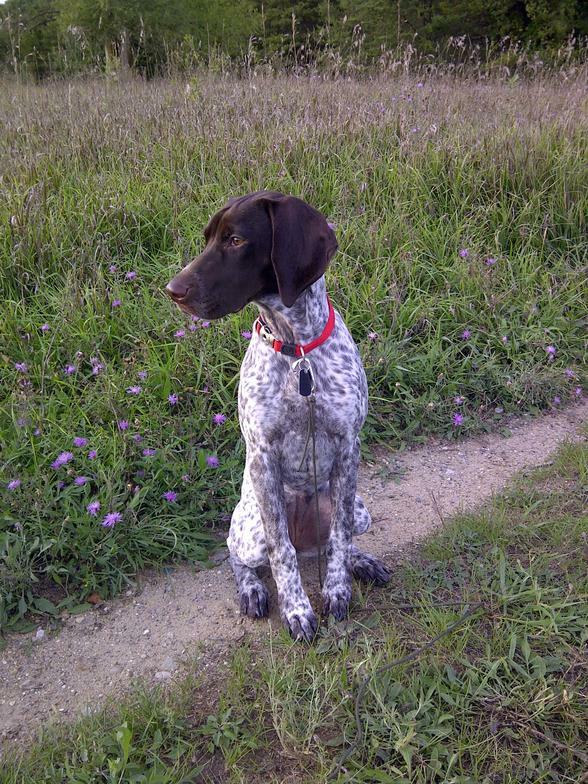 Deon Dwyer's new female pup posted 10/3/11. 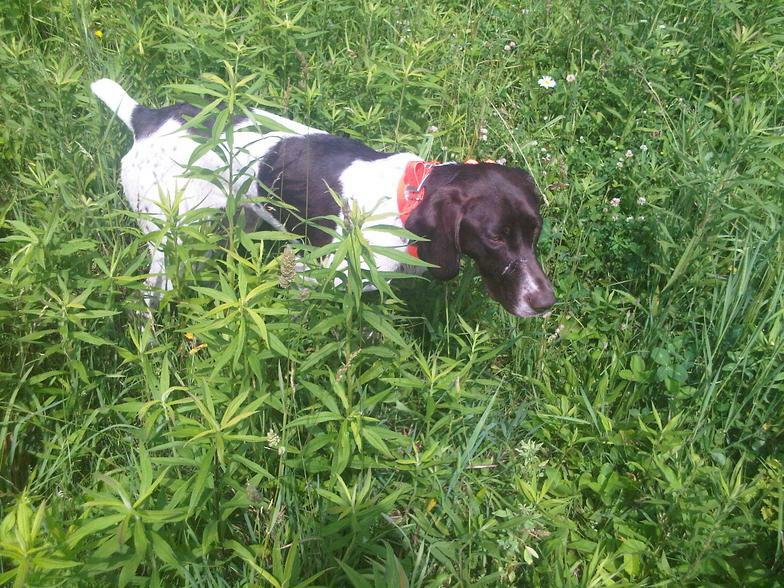 Darrell Beaudette's nice female Isabella, (Bella) sitting and standing. 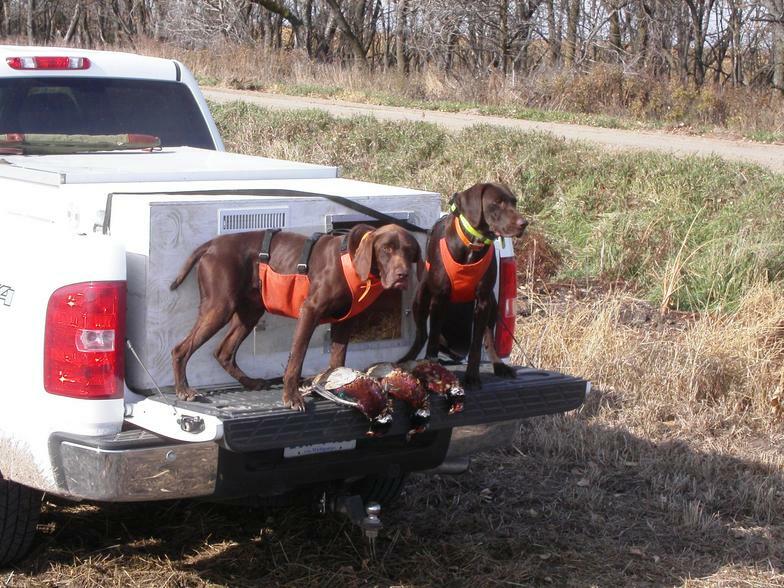 This is Kevin & Stephanie Pressley's young male pup name Moose, sired by Buddy out of Bella (See Bella above) shown on left. Moose a good name for him about 35 lbs at 3 months. 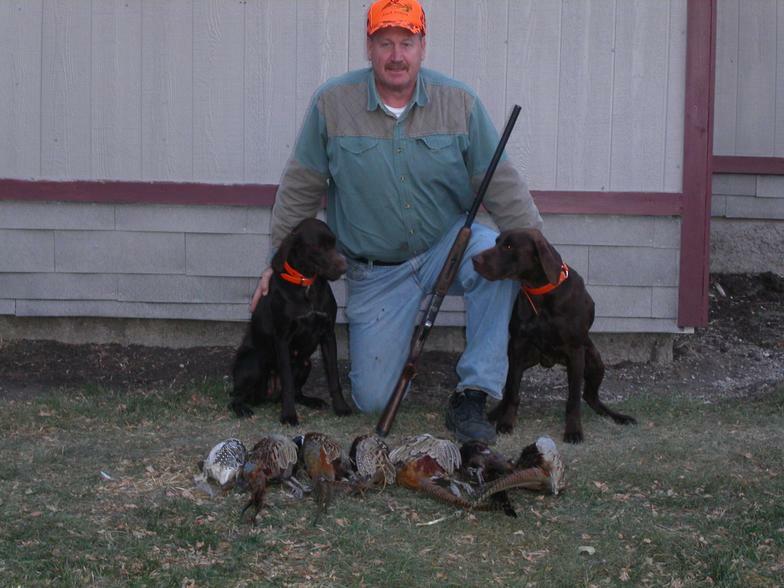 The good looking guy on the left is me holding Coco and Buddy during the fall 2010 trip to South Dakota. 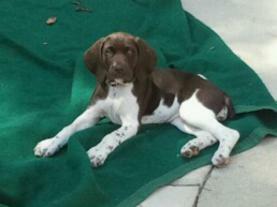 That is Ty, my friend Al Robbin's grandson hold his Brittany pup. 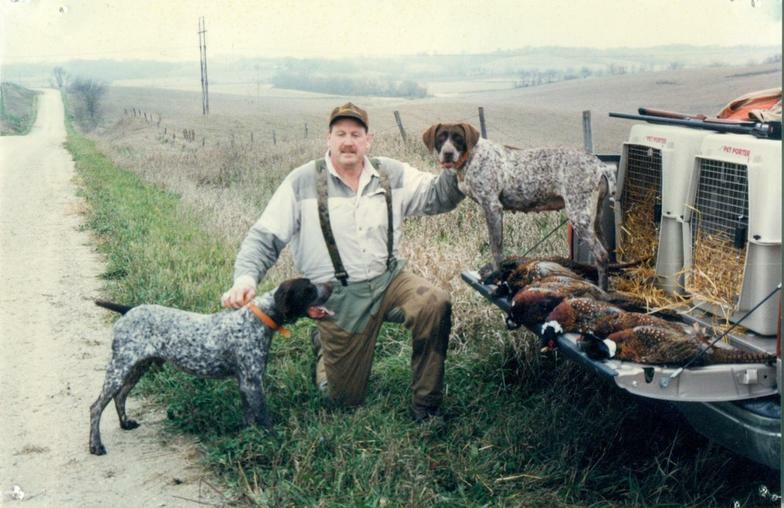 This is Al on the right holding his old faithful Brit Toby. 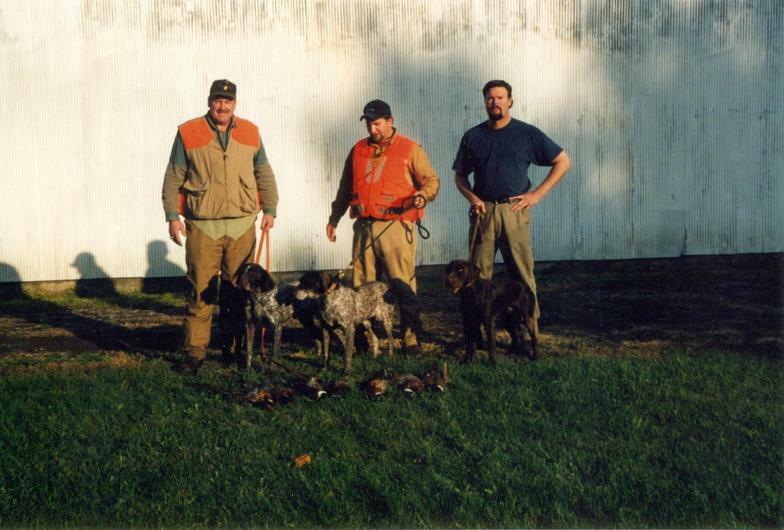 That pile of birds was taken by the 3 of us on the 2nd day of our hunt. 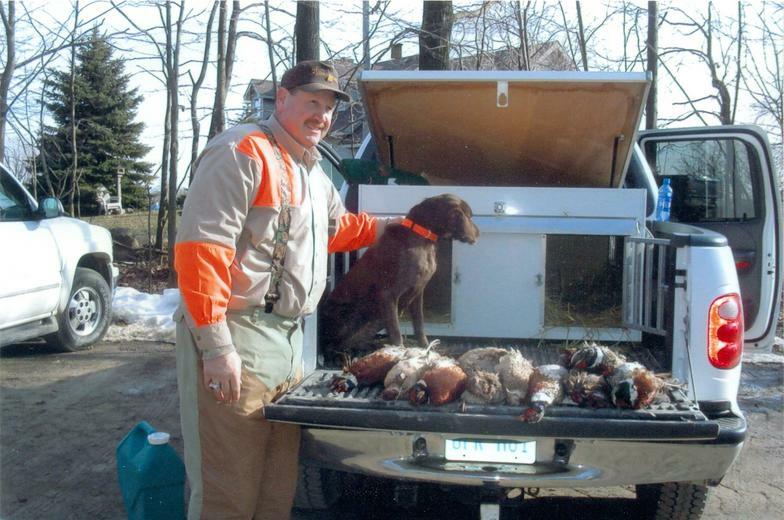 Note the yellow walk in area hunt sign on the left picture. Not a bad day for a public walkin area on the second week of the season. 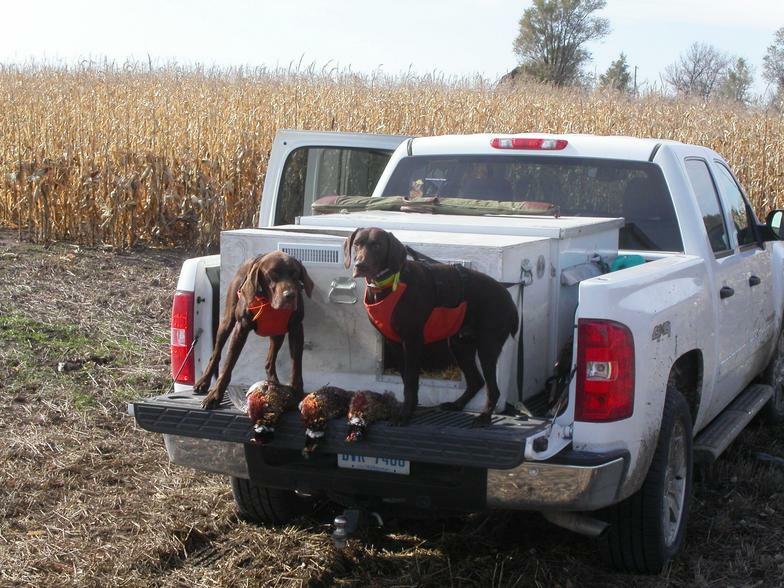 We hunted in the Redfield area last year and going back agin this year. Can't wait. 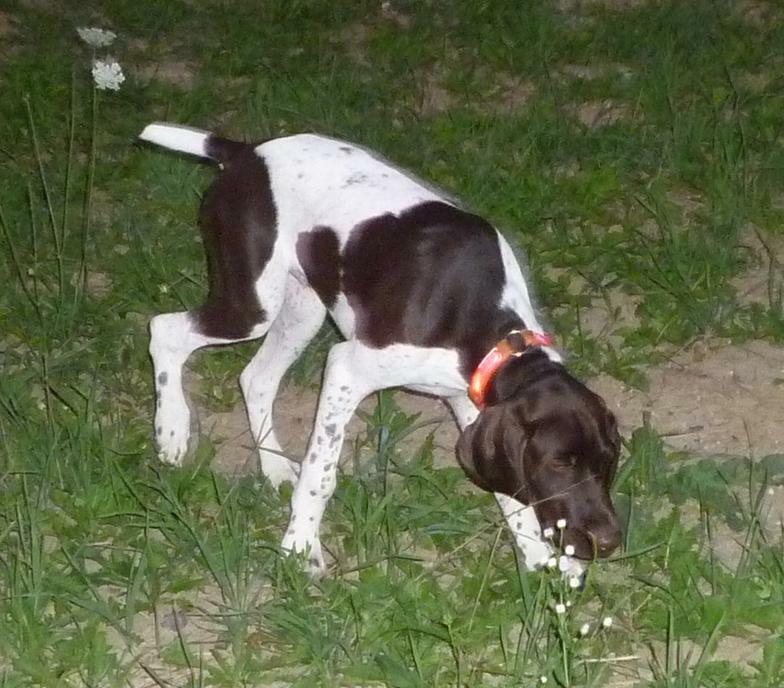 A couple of pictures of 5 month old male pup out of Fred Witten's Jackie and Buddy's first litter. Taken this past winter in northern Illinois. Danny Norman's female Double Dealin' Maddie. 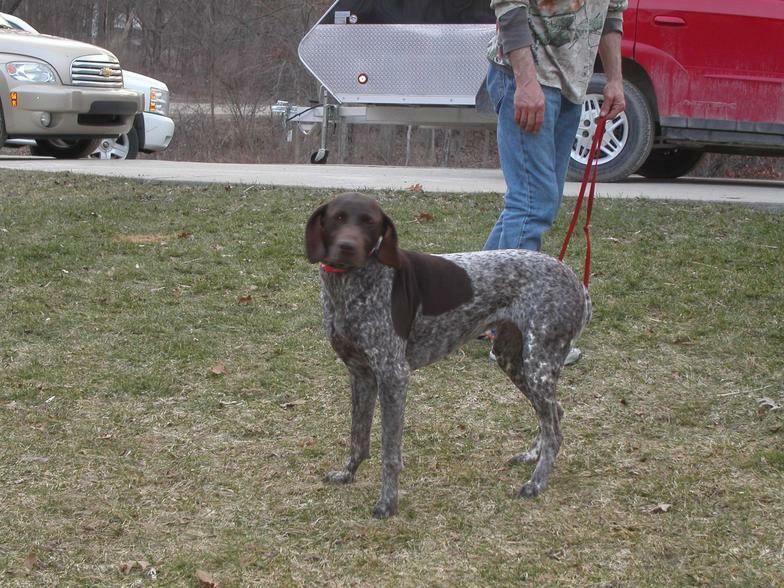 A nice Hustler bred female. Danny bred Maddie to Buddy last summer and it produced a fantastic litter. I missed the opportunity to keep one of those pups and I'm still mad at myself. 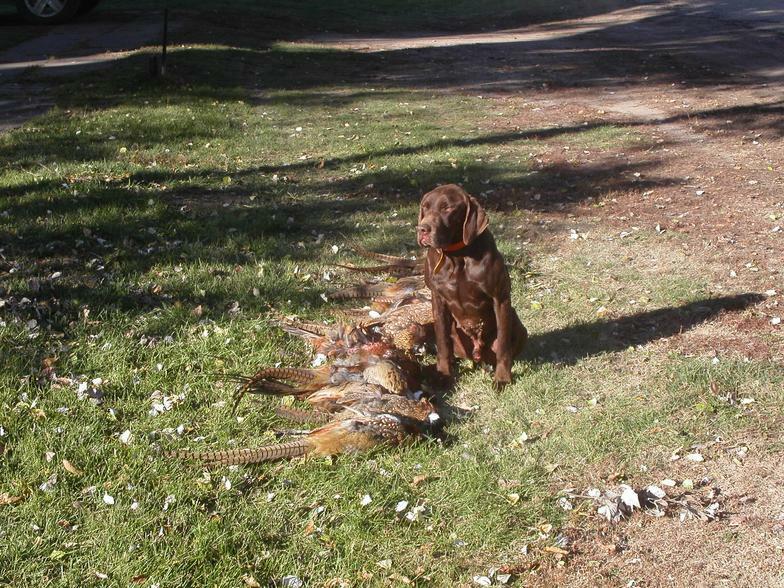 Hopefully I can get Danny to repeat this breeding. 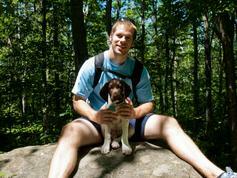 Josh Harris and his pup Remy. 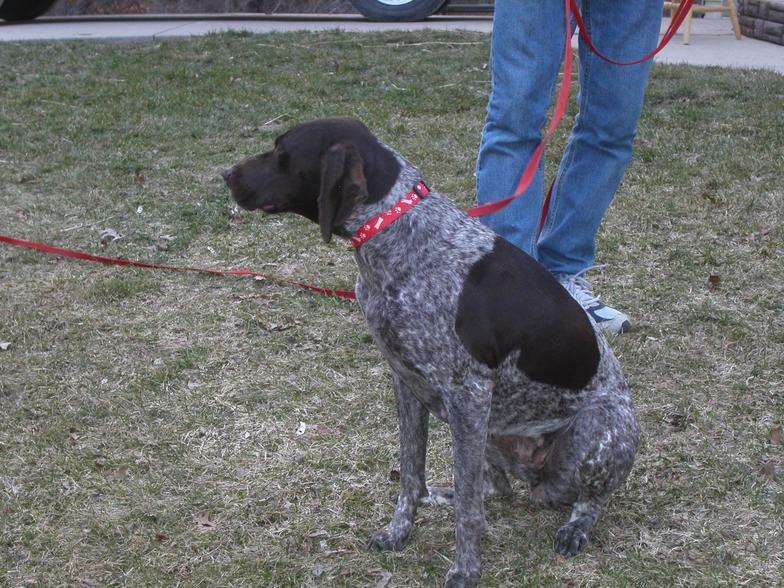 Remy is one of Buddy and Maddie's pups. 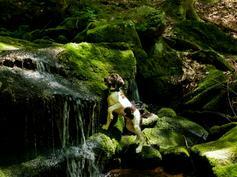 Middle picture is Remy climbing water fall. See what Josh has to say about Remy on the Customer comments page. 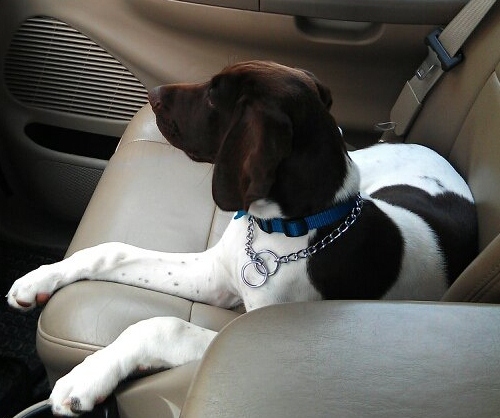 Remy on the way to vet for check up. A couple more pictures of me, Coco, & Bear in S.D. Charlie & Coco running their daily laps around the flight pen. 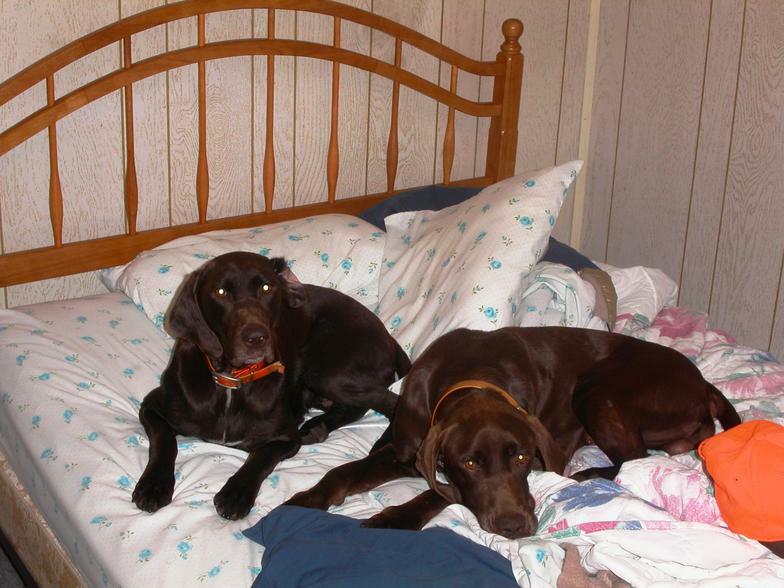 Coco & Bear keeping the bed warm while I'm in the shower. They take to lodge living pretty fast. What the heck, they are on vacation too. 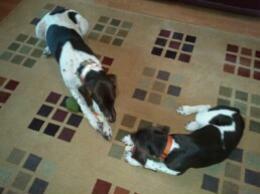 This is Buddy on the left getting reaquainted with Saddie out of Buddy & Witten's Jackie. 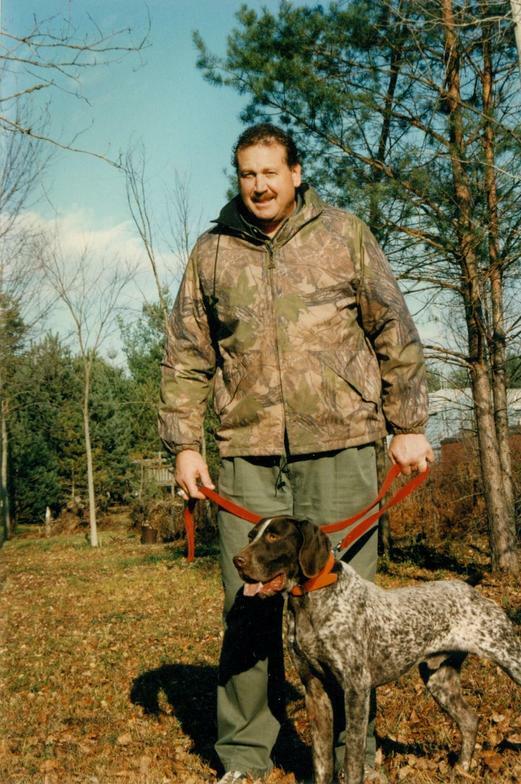 Saddie is owned by Brian Kahl and familty. 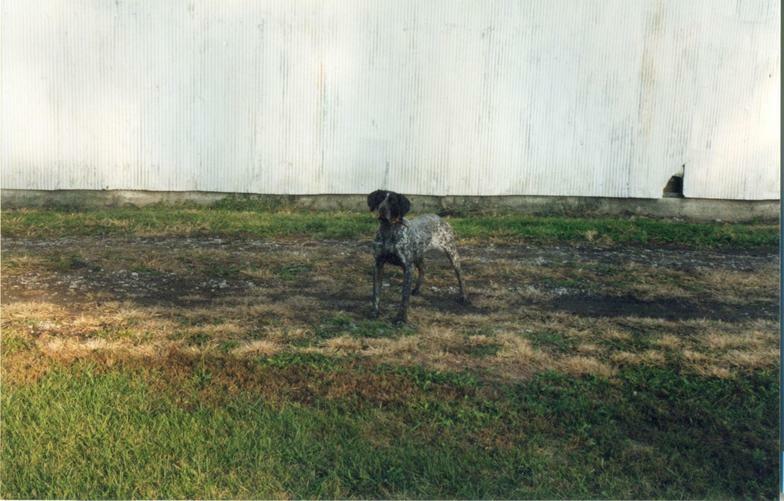 A few more pictures of Saddie getting some excellent training from pro trainer Charlie Linblade. Both pictures taken this spring. Saddie about a year old or so, as far as Charlie's age, you'll have to ask him. 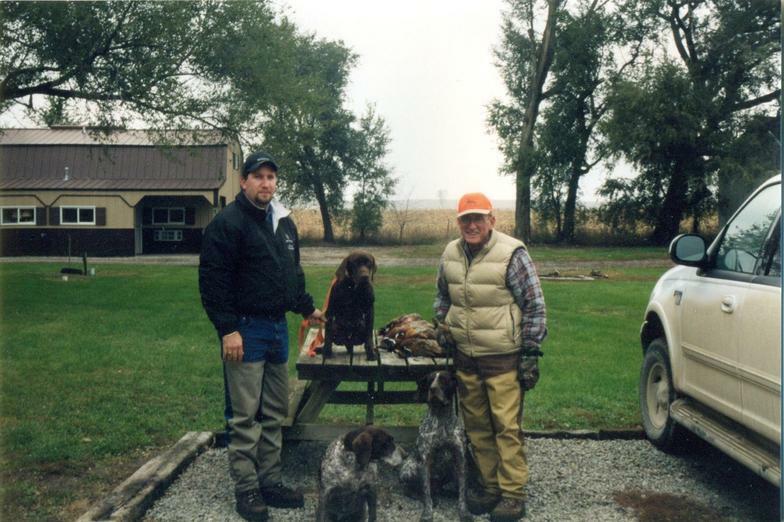 A younger Saddie on the left. Brian was so happy with Saddie, he wanted another pup just like her, so that is what he got. 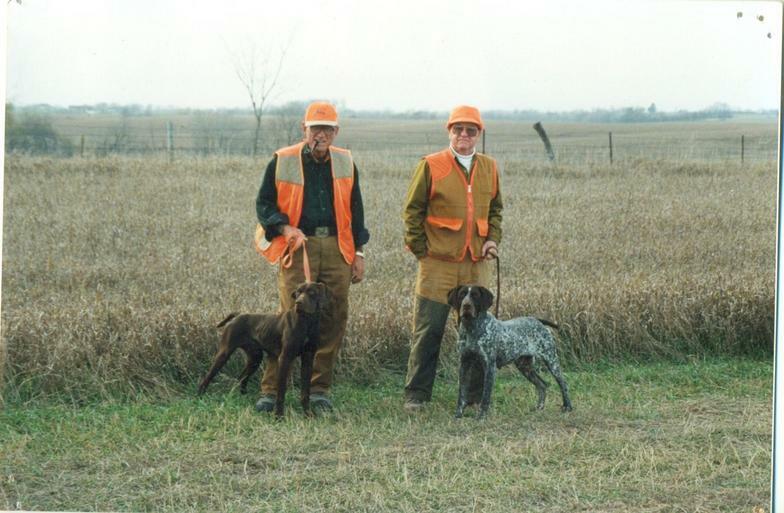 A year after the first breeding between Buddy & Jackie, we had a repeat. 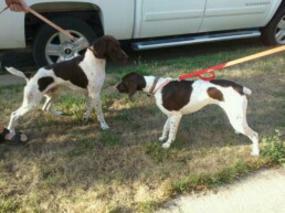 That is the new addition on the right, I believe Scout is the name and her picture is below. 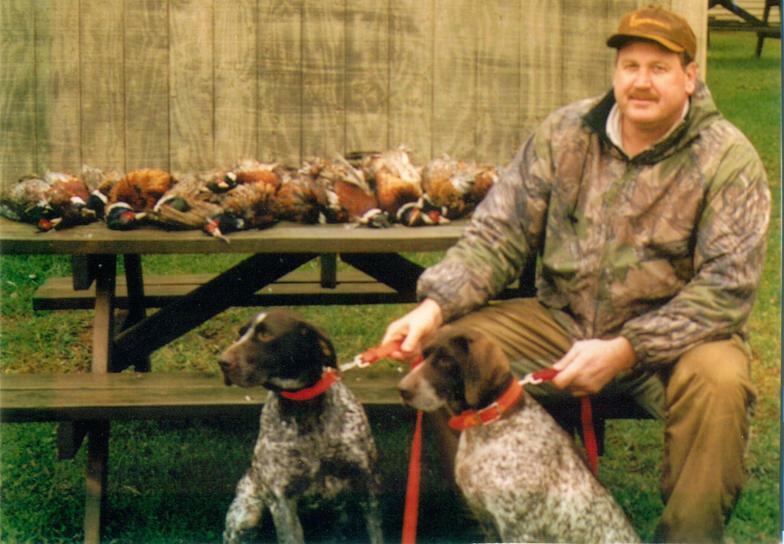 On the left and right is a couple of pictures of Phil Raftis's pup Floyd. 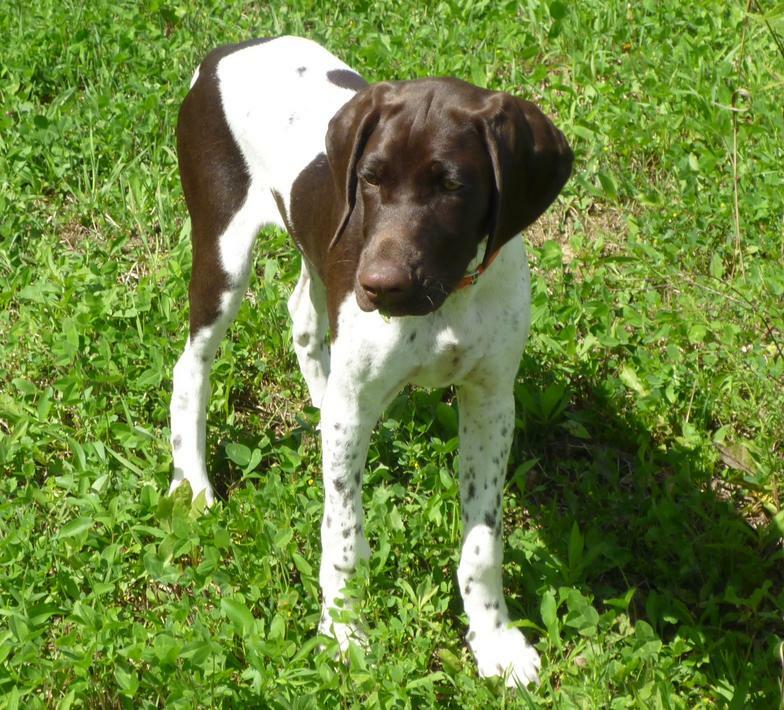 Floyd was my pick from the Buddy x Double Dealin' Maddie breeding. I had already sold my pick to Phil prior to me picking him up. As it turned out, Phil had vacation already planned so he left Floyd with me for a couple of week. During this two weeks I was so impressed with this pup, I tried to talk Phil out of buying him. The pups from this litter was performing as 1 year old dogs at 10 weeks of age. 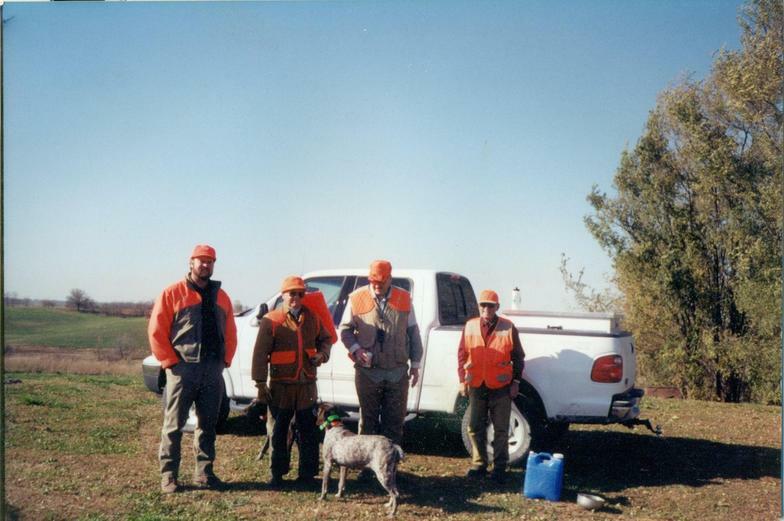 Naturally they could not cover the ground the one year old could, but the use of nose, finding birds, and holding points, was on par or even better than a lot of 1 year old dogs I've seen. 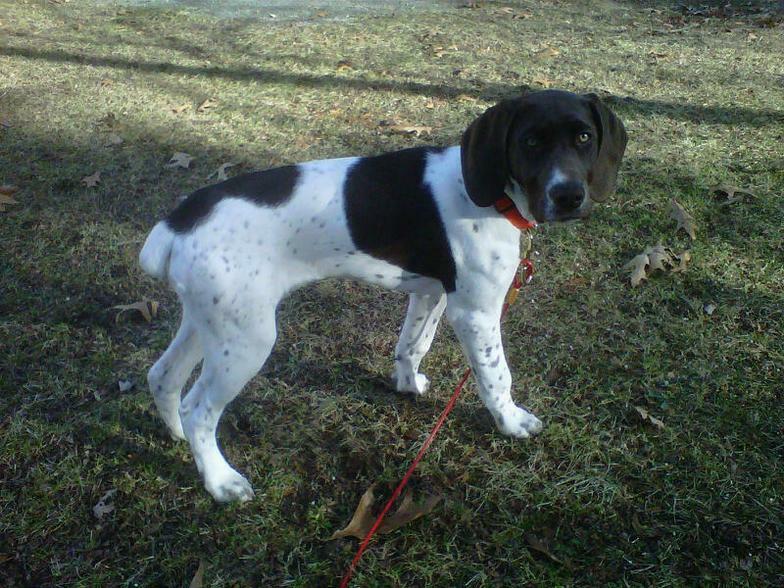 I'm hoping I can convince Danny Norman to say yes to this breeding one more time. 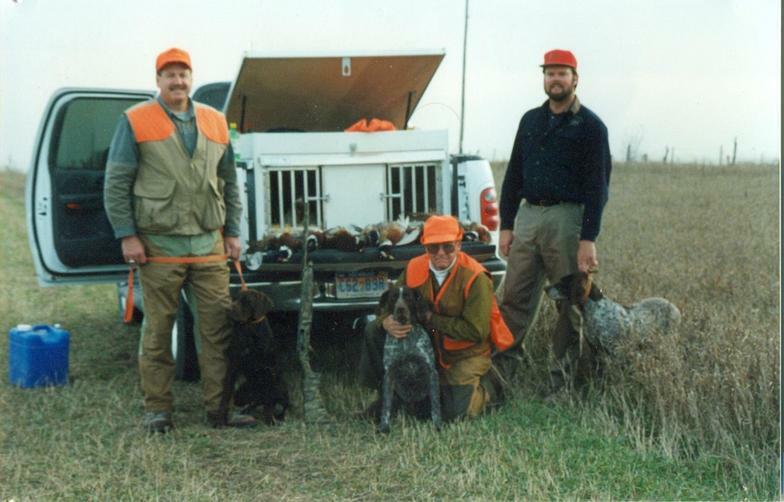 About 1993 or so, that's Watt About BOB on the left, his Dam Dotty, my first Shorthair, and a younger me. 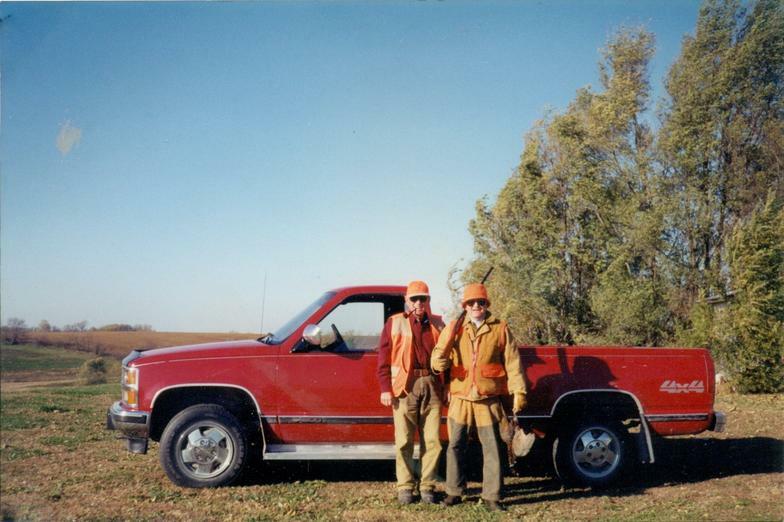 Tom Treuter on the left resting up after a days hunt in Iowa. Tom was just telling us how many more votes he needed to have won People Magazine's 1995 Sexiest Man Alive Contest. This was around 1998 or so. 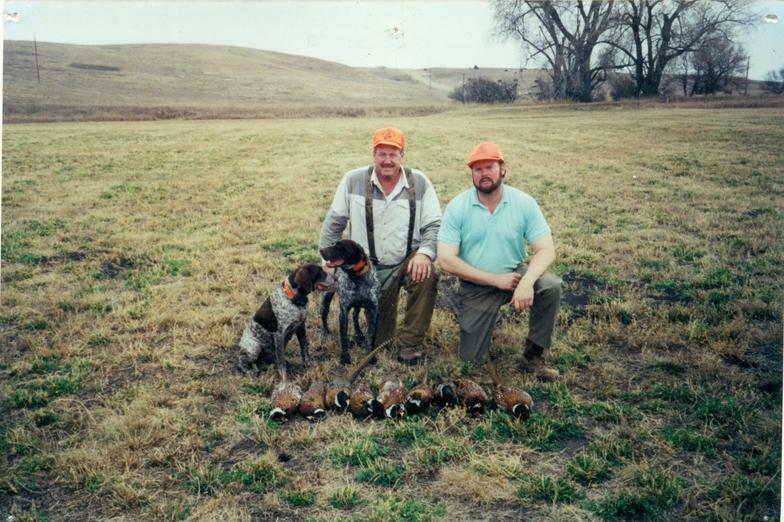 Me on the left and friend Steve Flemming on right, a days limit on my first trip to South Dakota. 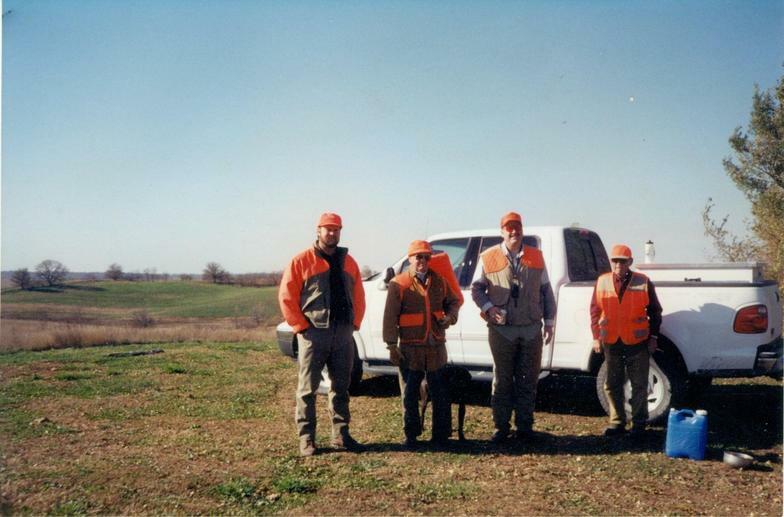 My friend Tony Moore, Steve Flemming with me in Iowa fall of 2002. 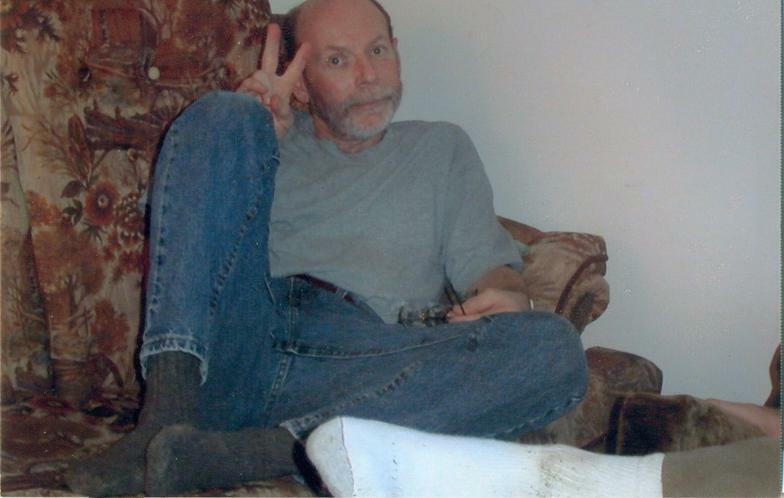 This picture taken by John, mentioned above, right before I switched places and I took the picture above this one. 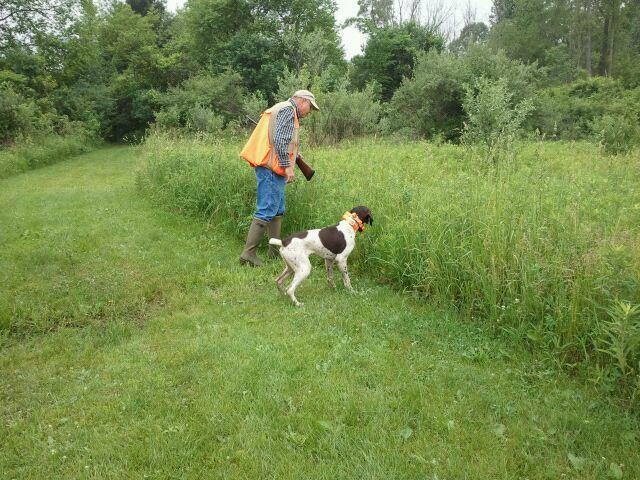 ABOVE: This cover is not very thick, but when Al took about one more step 6-8 pheasants came busting out. Al's a great shot and dropped two of them. I had the camera ready to take some action shots, but it happened so fast I missed the opportunity. BELOW: Here's two of my assistants. grand daughters McKinley on left and Delaney on right. 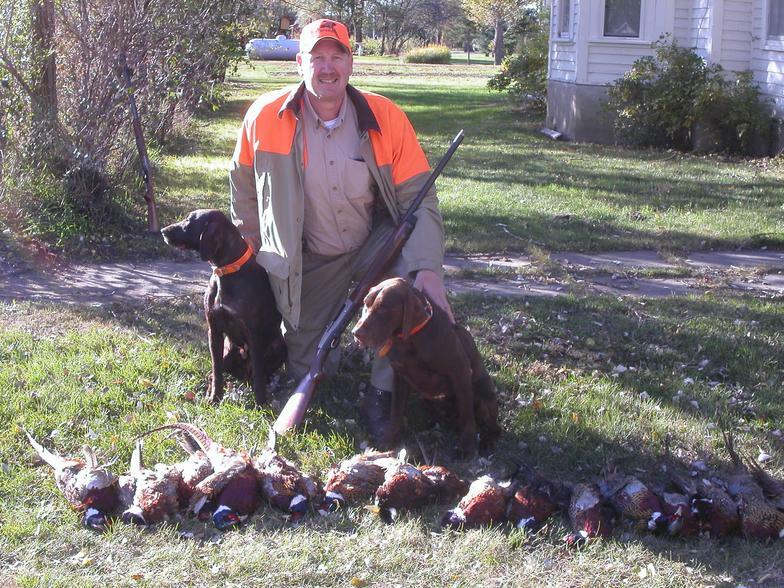 RIGHT: Here's Al getting a little rest and getting motivated to go clean birds. 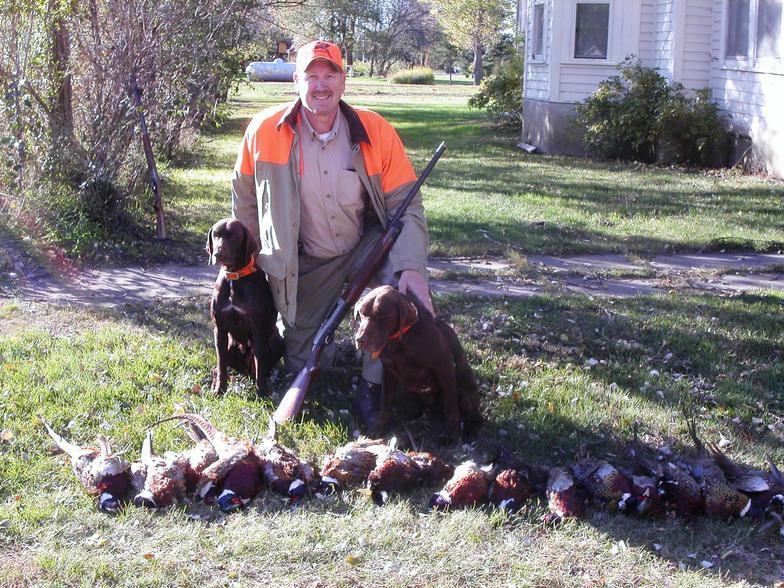 This is our house in Refield South Dakota where we stay during our hunt. 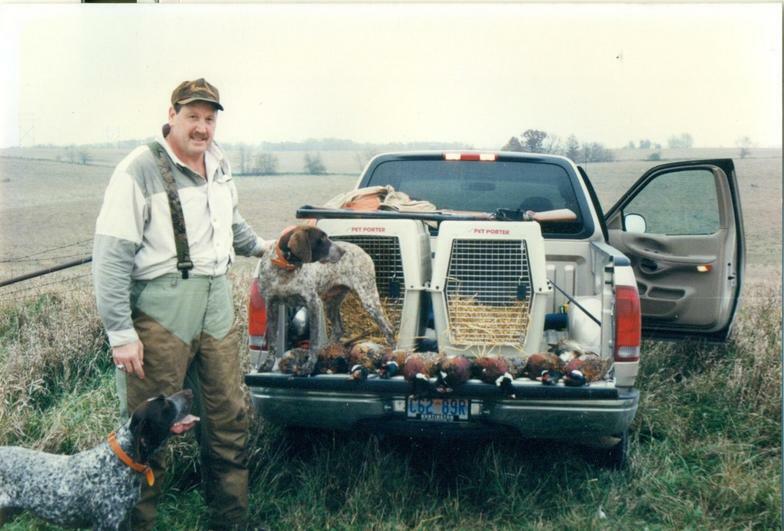 SCHARRER'S WATT ABOUT BOB - A great dog, did everything. SUMMER 2016 PISTOL PETE X GAMBLE'S TAZ PUPS AT 5 WEEKS OLD.